Published: Jan. 6, 2013 at 11:37 p.m. Updated: Jan. 7, 2013 at 08:19 p.m.
Oregon coach Chip Kelly isn't going anywhere. The Philadelphia Eagles and Cleveland Browns, meanwhile, are back at square one. NFL.com's Ian Rapoport confirmed Sunday night that Kelly will stay in college after the coach dined for the better part of the weekend with both NFL teams. The French-like length of Kelly's meals indicated he was serious about coming to the NFL this time, but ultimately he didn't find what he was seeking. It's a huge setback for both organizations, no matter how they spin it. (And they've already started.) The Browns landed in Arizona and spent valuable time zeroing in on their No. 1 target. Meanwhile, their No. 2 target, Doug Marrone, became the new head coach of the Buffalo Bills. The Eagles also were interested in Marrone, and both teams met with Penn State coach Bill O'Brien. O'Brien is staying at his job. The Eagles wanted an offensive mind to re-energize the franchise, and they focused on college coaches. They don't have a clear favorite for the job now. They've interviewed Atlanta Falcons defensive coordinator Mike Nolan, Falcons special-teams coordinator Keith Armstrong and Denver Broncos offensive coordinator Mike McCoy. Indianapolis Colts offensive coordinator Bruce Arians, Seattle Seahawks defensive coordinator Gus Bradley and Cincinnati Bengals offensive coordinator Jay Gruden also are on the Eagles' list. In short: The Eagles are on to their second tier of candidates. They hope to find someone who wows them. The Browns are in a similar position. 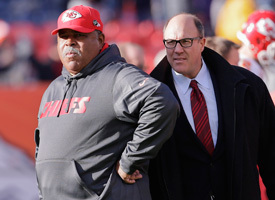 They've met with Arizona Cardinals defensive coordinator Ray Horton and former Cardinals coach Ken Whisenhunt, but they don't have a clear leader in the clubhouse. They're expected to open up their search. Only Kelly knows why he stayed at Oregon. It might have been the money, but it more likely was the power (i.e. control of the roster). Whatever the reason, the Eagles and Browns wanted him badly. Their actions said it all. They swung and missed. One week after the end of a painful regular season, the Eagles and Browns lost again Sunday.